As this is my first blog about perfumes I was wondering what perfume to choose to write about. I wanted to write about a perfume I really like and from a fragrance house I really like as well. Penhaligon´s is such a house and British. Penhaligon´s is a very old fragrance house which started with a shop in London in 1870. Their site is one of the best from a fragrance house I have come across. They give online advice on a perfume if you fill out a form online and sent it to them. Which I did and I will write about their advice next time. About the eau de toilette Castile. I was drawn to this perfume because of its name. Castille, one of the now autonomous communities of Spain, say a kind of state within Spain. To me if you say Castille you say Spain in all its origins. And this appealed to me, being partly Spanish. So when I smelled the eau de toilette Castile I was really surprised to smell Spain, that is azahar. Azahar is the Spanish for orange blossom. 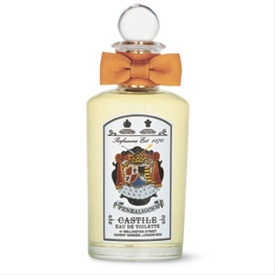 You smell Castile by Penhaligon´s and it smells so lovely of orange blossom. But not only orange blossom, as I have smelled other neroli or fleur de oranger scents before. And I do not like most of them. Like Serge Lutens Fleurs d´oranger which I do not like either. Maybe it is the mixture of neroli, petit grain, and orange blossom in Castile. All scents of oranges. I do not know but it reminded me of my Spanish grandmothers home and all the lovely memories of wonderfull Christmas holidays came up. Whoever made this perfume must have had quite an idea of how Spain smells. I could not find any information about the perfumeur of Castile, unfortately. If Spain would be a smell, to me, it would be Castile by the English perfume house Penhaligon´s. So would I recommend it? Yes I would if you like neroli, fleur de oranger or orange blossom and a summery smell into your house. Penhaligon´s sells scent library with 10 different samples on their site. The older scent library contains Castile as well. The scent library can also be bought via ebay from time to time as well. Commentaries online were quite positive. American reactions commented on the scent as a grand old European hotel soap scent. In general it was commented that it is expensive and some say it is a soapy scent. In the Netherlands a bottle of 100 ml is 90 euro. But you can buy Castile quite regularly on the British ebay site for half or even a third of that price. You can order 5 different samples in the Netherlands at the webshop from Celeste in The Hague for 10 euro. On Penhaligon´s site you can see where their scents are sold throughout the world. Castile is in the citrus group and on some sites it is considered a masculine smell. After shave and shaving cream is sold as well. But personally to me it is a more feminine scent and my boy friend agrees. He likes the scent as well. The eau de toilette was bought by myself. I do not have any links with Penhaligon´s, my comment is completely independent.